Houses with BIG garages that are for SALE, including: 2 or more in an Urban City; 4 or more in Suburban or Rural areas; and Houses with RV parking (inside or outside). Commercial or Residential real estate that is being auctioned as the sales method. It can be a Retail Auction or a Foreclosure Auction. Facilities like: car condos; indoor vehicle storage; airplane hangars; and other commercial locations focused on vehicle storage that is outside or inside (for rent or sale). Tracks for sale; lots for development and structures built on race tracks such as houses, condos, garages, etc. that can be purchased or rented. Racing Real Estate. This is for garage or parking space being rented or sold SEPARATELY from your house. This category is NOT for selling your entire house. It's just for parking or garage space you're renting or selling. Houses or real estate owned by celebrities now or in the past. Place your property ad in one of these great niche real estate categories. We offer singular ads and unlimited posting ad plans available to help you sell or rent. Post yours for sale. New and used cars, trucks, motorcycles, RV's, Trailers, Big Rigs and Boats that are not collectibles. This is any AD that was marked as Sold or Rented by the Ads owner, CP.com research, or data matching with 3rd party databases. Houses with BIG garages that are for RENT, including: 2 or more in an Urban City; 4 or more in Suburban or Rural areas; and Houses with RV parking (inside or outside). Investment opportunities in properties that allow an automotive use (by zoning or owners), such as auto dealerships, gas stations, auto repair shops. You should target your vacation properties to vacationing car collectors & racing fans. Car events and races in your area increase demand ... advertise here. This applies to private owner rentals and hotels. Are you an Appraiser? Advertise here to provide valuation appraisals on properties with large garages or shops. Do you want to simply display your awesome garage on CarProperty.com? You can do it in this category if your property is not for sale or rent. 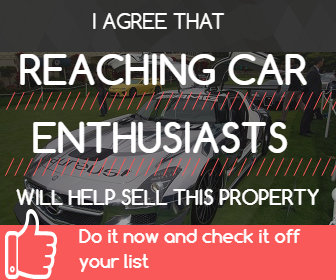 Do you want to rent or buy a garage for your cars, vehicles, toys or profession? If yes, request it by posting it here! Post yours for sale. Find classics, exotics, race cars, boats, motorcycles, rv's, trailers, and big rigs. Individual vehicle AD's; or Unlimited Dealer AD Plans are available.